Everyone has had nights sleeping on the couch. Whether you’re in the dog house, fell asleep half way through a movie, or are staying on a friend’s sofa during a vacation, you’re no stranger to trying to catch some sleep on the couch. 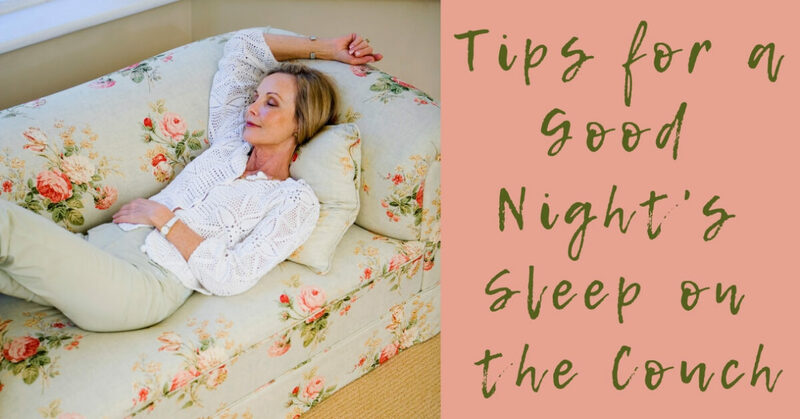 Sofas aren’t the most comfortable place to get a full night’s sleep, but if you want to wake up refreshed after a night in the living room, here are a few tips for a good night’s sleep on the couch. Creating a firm surface: The trick to having a great night on the couch is taking the time to prepare your surface. Couches are made for relaxing, and are often very soft. While this is great when you want to snuggle in and watch a movie, when you’re trying to sleep you might find yourself sinking too far into the cushions, and wake up with a very sore back. The couch cushions are too soft, and there aren’t springs under all that foam to help disperse your weight properly. To create a firmer surface, place a thick blanket on the cushions underneath your hips. You’ll get a great sleep, and won’t wake up with a bent back. Making it wider: Do you keep slipping off the couch when you roll over? To make the couch wider, and avoid rolling out of bed in the middle of the night, take the back cushions off the couch. You’ll have more space, and if you’re a side sleeper you’ll be able to have a comfortable night on the couch. Add a sheet: Don’t underestimate how much comfort a sheet will add. You might not think it will make a big difference, but putting a sheet over the bottom cushions can make any couch feel more like a bed, and make it a cozy place to sleep. Steal the blankets: Whether you’re sleeping at a friend’s house or in your own living room, make sure you have a comfortable, soft blanket. You’re already sleeping on the couch, so steal a blanket and don’t settle for sleeping with the throw blanket, and waking up from cold. Avoid sleeping with the throw pillows, and use a real pillow if you can, as this will give you proper neck support throughout the night, and help you sleep peacefully. Once you’re ready to crawl into your makeshift bed for the night, take a moment to think about the best sleeping position for the size and shape of the couch. Most couches aren’t as long as a bed, so if you’re used to stretching out at night, you might have to rethink your position. If the couch is long enough, try sleeping on your back. This will distribute your weight more evenly, and you’ll be less likely to toss and turn in the night, or fall off the couch. Sleeping on a two-seater? Try curling up in the fetal position, and you won’t have a problem with the shorter length for a night or two. Not only will you fit more easily on the couch, but your body heat will keep you warm in case you don’t have a big blanket for the night. Are you struggling to fall asleep on the couch, and feel like you’ll never get a good nights’ rest? As a last resort you can try sleeping on the floor. While this might not be the most comfortable option, the floor will provide a firm surface, and you’ll also have a lot more legroom. Take the cushions off the couch and use them to create a temporary mattress on the floor. You might find that this will help you get a good night’s sleep, and wake up refreshed in the morning. Have you been struggling to sleep? Has your spouse banned you to the couch because they can’t sleep through your snoring? Rather than sleeping on the couch every night, why not visit us at Sound Sleep Medical, and find out why you’re not sleeping. We’ll help you discover the reason for your snoring, tossing and turning, or anything else that’s keeping you or your spouse awake. Don’t sleep on the couch another night, but call us today!